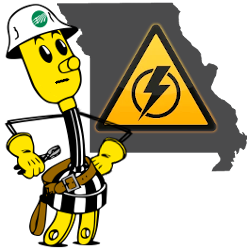 The Association of Missouri Electric Cooperatives, the National Weather Service, and the National Oceanic and Atmospheric Administration (N.O.A.A.) helped fund the installation of weather radio transmitters throughout the state in order for Missouri residents to be able to receive weather related announcements through the use of a weather radio receiver. Severe weather and tornadoes can occur in Southern Missouri at any time of the year, but are most common during the months April through June. Although a majority of severe thunderstorms and tornadoes form during the afternoon hours between 3 p.m. and 7 p.m., they can happen anytime. Often tornadoes form so quickly that the moments before are vitally important for the safety of those in its path. On average, over 800 tornadoes strike various places in the United States each year. A weather radio should be a standard piece of safety equipment in every home. With your weather radio you will hear continuous up-to-date weather information from the National Weather service in Springfield, Missouri. The information is regional to the Howell-Oregon Electric Cooperative area with broadcast towers outside of West Plains, Summersville, Gainesville, and Alton. A weather radio receiver sounds an advance warning when it receives an alert broadcast from a National Weather Radio transmitter. N.O.A.A. honored the Association of Missouri Electric Cooperatives (AMEC) for the distribution Weather Radio transmitters in southern Missouri. With funding from the Electric Cooperatives in Missouri, the state became the first in the nation to add transmitters to the National Weather Service network, and to date, there are very few areas in the state that are not within range of a NOAA weather radio broadcast. The following Weather Radios may be purchased from Howell-Oregon Electric Cooperative. Sales Tax is included in prices below; prices are subject to change without advance notice. Emergency weather radio receivers may be purchased at the Howell-Oregon Electric Cooperative office during regular business hours, Monday through Friday between 8 a.m. and 5 p.m. For more information, call the HOEC Member Services department at 417-256-2131 or toll-free 1-888-HOE-POWER. For more information on the emergency weather radio services available in the area, see the Weather Radio Brochure, below.